Yesterday I went to visit the annual Pin-Up Pop-Up Shop organised by Ronke Fashola, the brains behind vintage-inspired ethical fashion brand Love ur Look. 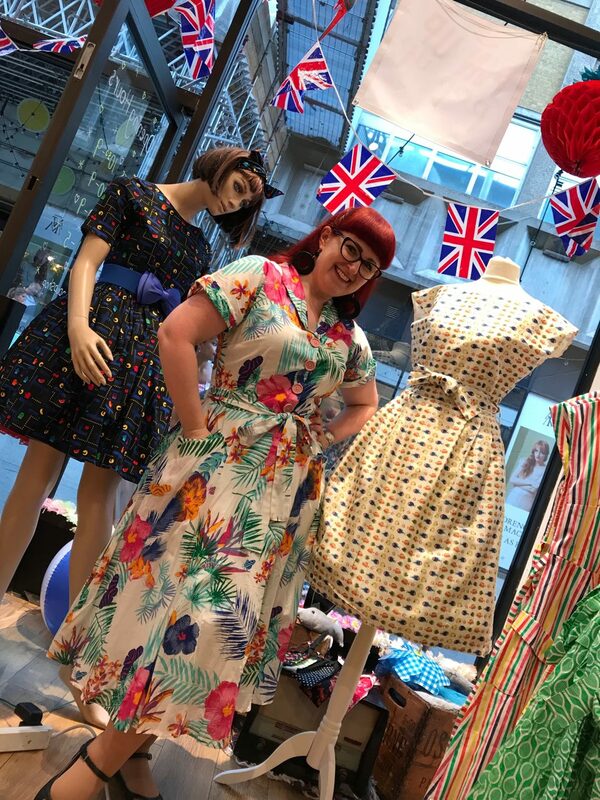 Each year she organises a pop-up featuring a selection of UK independent fashion brands with a vintage style, where you can meet the makers and try on a gorgeous selection of clothing in a wide range of sizes. 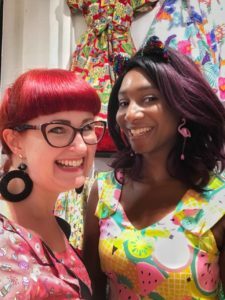 As well as catching up with the lovely Ronke, looking stunning in her fruity melon dress, it also was great to see Alison from Silly Old Sea Dog again, who was wearing a gorgeous summery orange print dress. 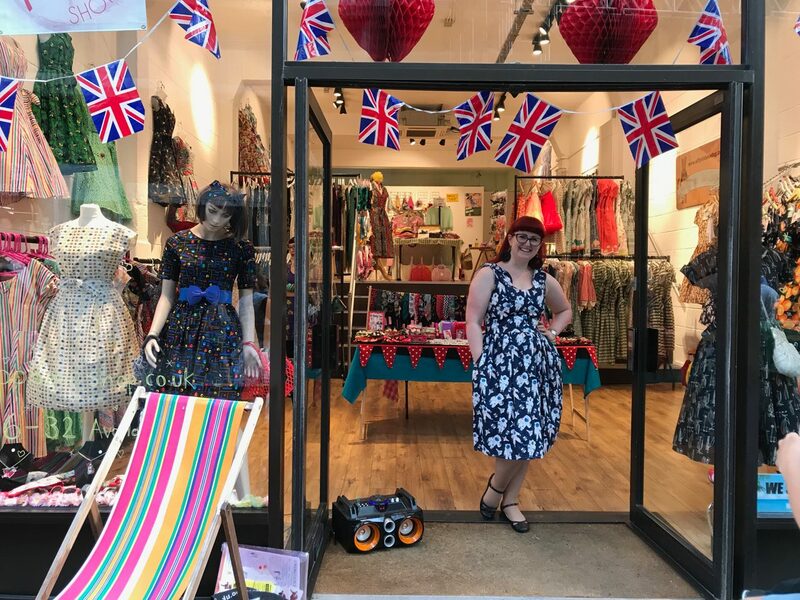 Just like last year, Alison offered to take photos of me in various dresses that I tried on, so thanks very much to her for all the photos in this post that are obviously not selfies. She’s great at getting lots of shots from different angles, and I’d love to have her around all the time to take my blog photos! 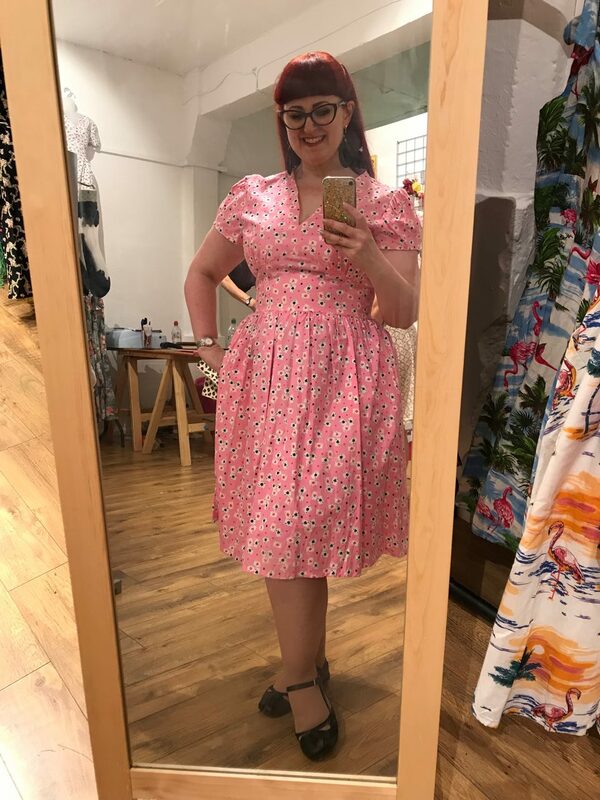 I tried on some dresses from Silly Old Sea Dog last year but couldn’t remember which size, so I forgot that I needed to size down as their fit is generous (I’m usually a 14 in full-skirted dresses but a 12 fit me perfectly here). 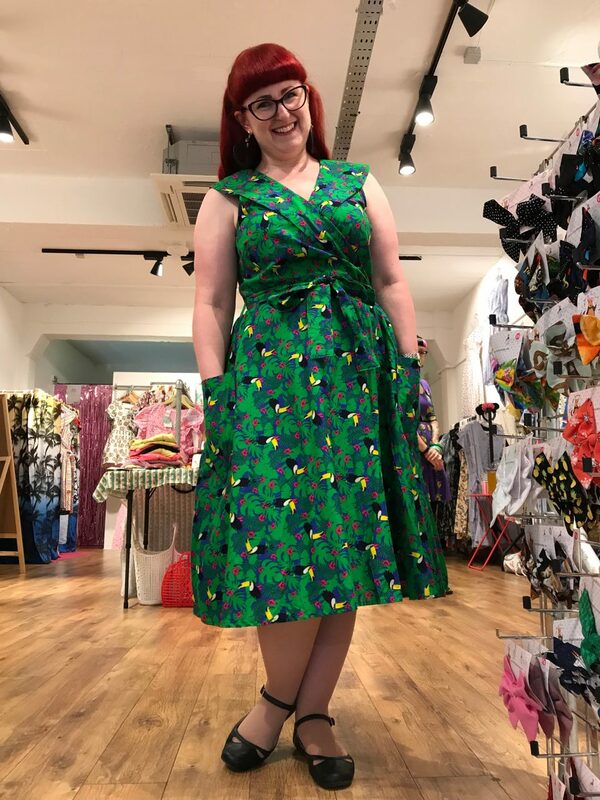 The tie shouldered styles are great for me as I have a short distance between my shoulders and my waist, and these frocks can be adjusted to accommodate that. I also find that their v-neck style works really well for me, especially in the longer length. Also… all Alison’s dresses have pockets! 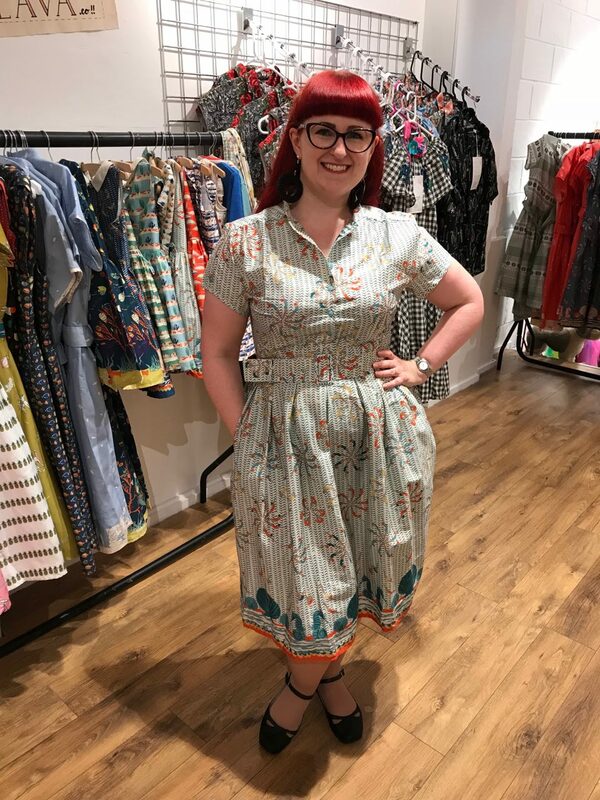 I also tried on a few dresses from Love ur Look that I’ve had my eye on for a while. They’re all made from a lightweight breezy cotton that is perfect in this weather (I showed up to the shop wearing a Love ur Look frock that I bought from the pop up two years ago!) and the various different styles all suit different body types so I knew that trying them on would help me find the perfect one for me. 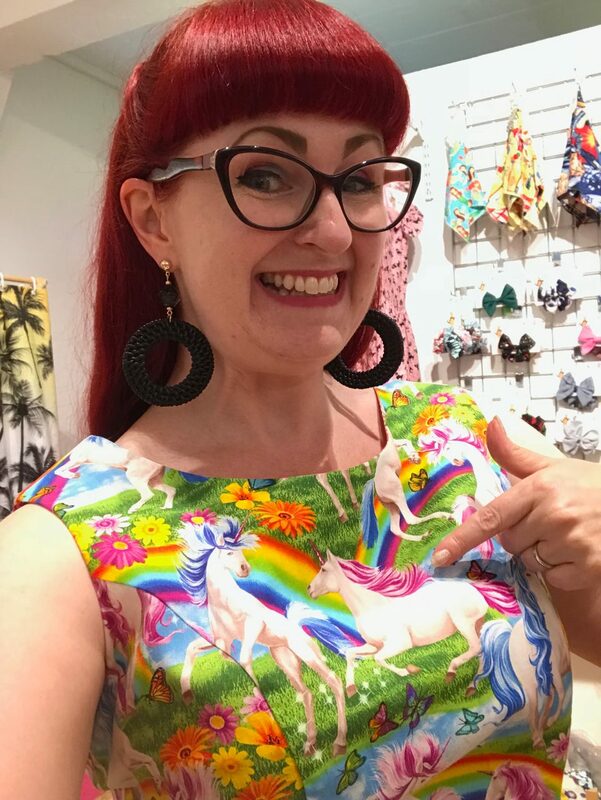 I loved the toucan print and the bright candy stripe fabric, but shirt dresses in XL are definitely my perfect fit from this brand. 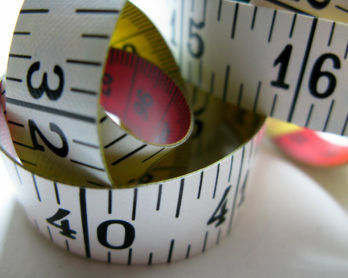 Plus… all Ronke’s dresses have pockets! I was so warm and tired by this point (it had been a long day! 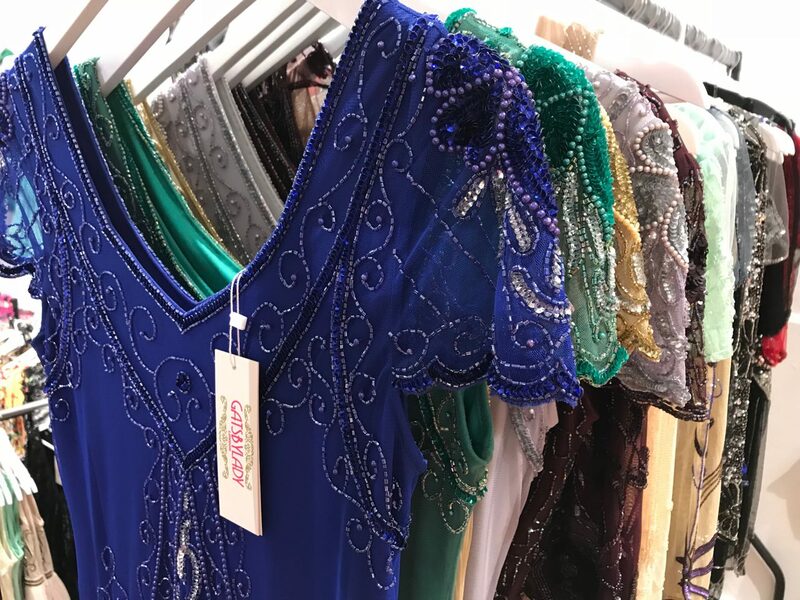 ), that I didn’t manage to try on any of the stunning beaded gowns from Gatsby Lady, but while chatting to Alison she told me the fit was generous and assured me that they look even more gorgeous on. 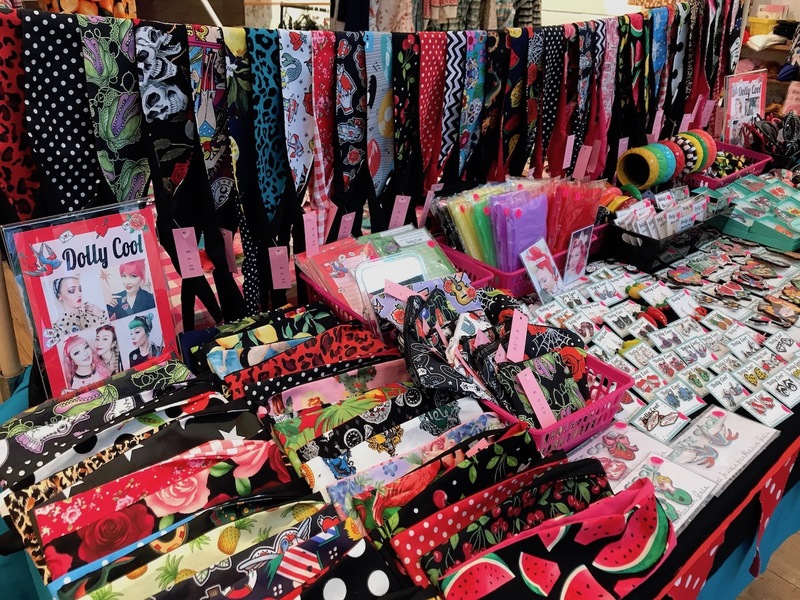 Before I left, I browsed some fantastic Dolly Cool accessories made by the lovely Clare but just couldn’t make up my mind what I wanted, so I think I’ll have to go through her Etsy shop and choose some jewellery there! 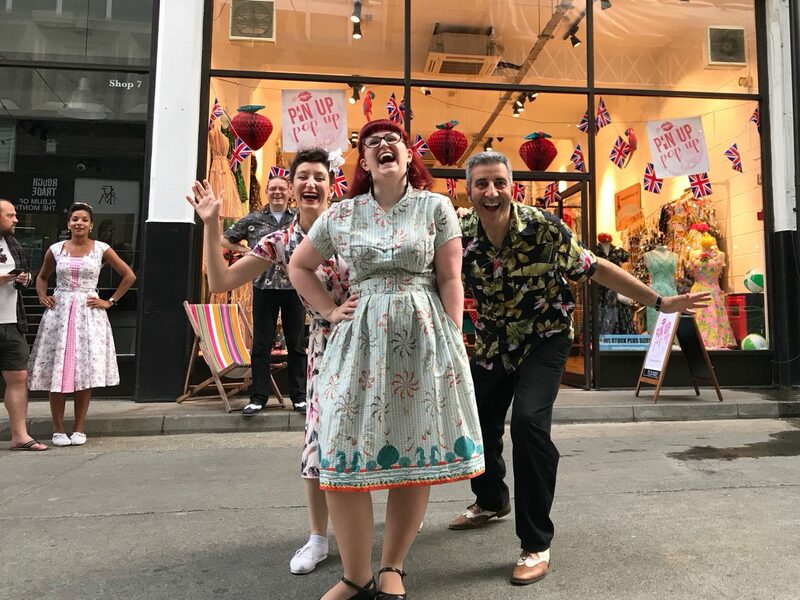 So far the shop has seen fantastic entertainment from Swing Dance UK (who crept up on me in the photo below!) and Helen Vintage Singer, and it’s got a lovely friendly welcoming vibe. 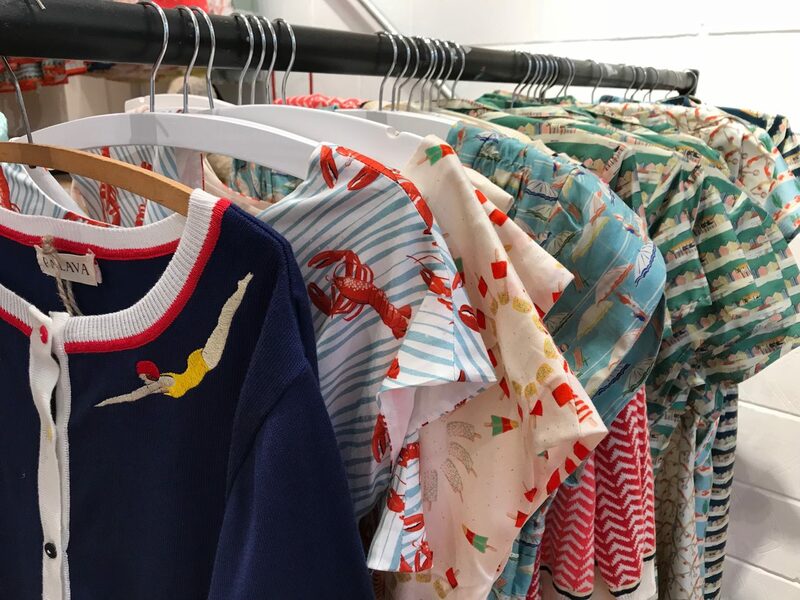 The pop-up is open all weekend, so get yourself down there to meet and support six wonderful women who are successfully running their own ethical fashion brands. 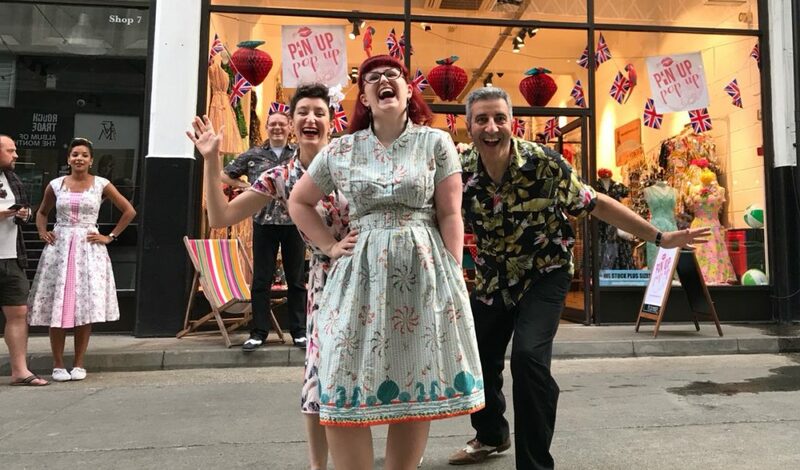 The Pin-Up Pop-Up Shop – featuring Love ur Look, Silly Old Sea Dog, Palava, Gatsby Lady, Dolly Cool, and Fairy Tale Collars – is open on Saturday 4th August (10.30am to 9pm) and Sunday 5th August (11am to 5pm) on Dray Walk, London E1 6QL. 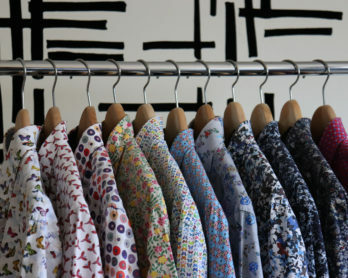 It’s right by the Old Truman Brewery, off Brick Lane, a short walk from Liverpool Street and Shoreditch High Street stations.